Cheated Out of Childhood: Please, Don't React; Respond. Through my experiences with conversations, and as a person who lives with chronic depression, it has come to my attention that many people don't know how to provide comfort or respond appropriately in times of need. Instead of listening to what's being said & taking the time necessary to digest it, reflect on it, then proceed with a constructive response, people jump to conclusions & say the 1st thing that comes to mind, or in other words, they react. But, many times, this can be unhelpful, or possibly even detrimental &/or destructive to the person that is in distress. See, when you react, there is no tact. In order to respond, you must think beyond the initial reaction. Therefore, to try & resolve this common dilemma, I thought I'd come up with a list of reaction pitfalls to avoid & healthy ways of responding. I am inspired to create such a list by communication theorists, such as Carl Rogers, the creator of Client-Centered Therapy (*Search for “Unconditional Positive Regard” “Empathic Attunement,” & “Acceptance.”), psychologist & couples counselor Gary Chapman, who authored The Five Love Languages, & Virginia Satir, who identified 4 unhealthy forms of communication (i.e. Blaming, Placating, Computing, & Distracting) as well as hypothesized a solution, A.K.A. "Leveling." For more information on her studies & ideas, you can check out her book The New Peoplemaking. Mine are very similar to hers, but rather, they’re situational, & I break them down into specific categories with concise details & examples. Yes, personally, I am educated & trained as a psychotherapist. But these suggestions are simple & can help any layperson communicate more empathically & effectively. 1 - Dismissing/Minimizing - This happens all of the time. Someone comes to you upset or with a problem, & the first thing you say is "Could be worse." Or, "It's not even that bad." One step further, you bring up a story that happened to you or someone you know & compare/contrast. This is not helpful. It just makes the person feel bad for mentioning what they're going through, negates their problem, & makes it look as if they’re complaining & whining. People, especially those of us who suffer from depression, want to feel heard & understood. Being dismissive or minimizing the problem makes it seem as if it doesn't matter, which only makes us feel more alone & like a burden to others. Another way of being dismissive is being too cheerful or overly optimistic. Saying things like "Just think positive!" Or, "Look at the bright side!" Or trying to cheer the person up by making a ton of jokes or changing the subject. If a person is feeling down, this will only make them feel like you can't see where they're coming from or are too uncomfortable yourself to discuss their sorrows. Being superficially happy is not a solution. Being realistic & supportive is. The definition of "gaslighting" is when you make someone feel crazy by discrediting them & making them doubt themselves. The way this is most often done to depressed individuals is when they hear phrases like, "It's all in your head!" "You're choosing to feel this way!" "You're making this up!" “There's nothing wrong!” "Stop being so negative!" "Stop pitying yourself!" "Stop feeling sorry for yourself!" A person who is depressed or facing a crisis is NOT choosing to! Depression is a mental illness, a chemical imbalance in the brain, a disease just like Diabetes or Asthma & should be recognized as such. People who face depression already feel crazy! They usually have excessive guilt & shame, feel hopeless &/or helpless, have low self-esteem, feel like a burden to everyone they know, have little or no motivation, lose pleasure &/or interest in activities they once enjoyed, experience weight loss or gain as well as insomnia or hypersomnia (not sleeping much/at all vs. sleeping too much), feel incredible loneliness or start to isolate, & may be beginning to see life as not worth living because this exhaustion & pain becomes unbearable! NONE of this is a choice, but it is all a part of the condition. These are the symptoms, & making comments like these is not only insensitive, but emotionally abusive & neglectful. To top that off, making statements like “You're being overdramatic!” or “You're such a crybaby!” are cruel & can make things worse. I cannot emphasize the importance of this enough. Do NOT gaslight. You may think you're giving them “tough love,” a “reality check" or snapping them out of their funk, but this type of language is incredibly inconsiderate and does more harm than good. This, at first, can be done with the good intention of changing a person's perspective or helping them to see more clearly. But if done carelessly or with persistence, it can become argumentative & damaging. For instance, say someone tells you about a friend that they feel slighted them or betrayed them. After you listen to their story, you start relating to & defending their friend's actions. Sure, maybe you think their friend didn't do anything wrong or malicious. That's fine, & you can express that, maybe offer some clarity. But if you go out of your way to analyze the story and identify with their friend, you're now taking sides & undermining their experience, making them feel like their point of view is insignificant or invalid. They came to you & told you the story because they were hurt & searching for support, not for you to overlook their take & ignore their feelings. The only time I really see this as being helpful is if someone is thinking irrationally or delusionally. Otherwise, it's unnecessary. This is one of the most common ones and I really dislike it. Humans, naturally, are fixers. When someone comes to us with a problem, it can be our first instinct to solve it. But giving advice when it isn't requested can be rude, especially if you're not well informed, qualified, or familiar with the person's situation. Very often, those of us who are feeling crappy just want to vent & release our frustrations. We don't always need help, just a listening ear to hear us out. If we ask for it, give the best advice & guidance you can! But if not, don't assume we need it & can't figure things out on our own. Perhaps you're trying to be helpful, but sometimes it's just insulting & not useful. Plus, if we're stuck inside of our minds all of the time, we've probably thought of all possible scenarios & decisions we could make & forged a plan. Validating - As humans, we all seek validation. We want to feel like others hear & understand us. We want comfort & consolation. Instead of resorting to the reactions above, try saying things like, "I'm really sorry you went through that." "That must have been tough." "Gosh, that sounds stressful." "Wow, that's harsh." "You've been through a lot." 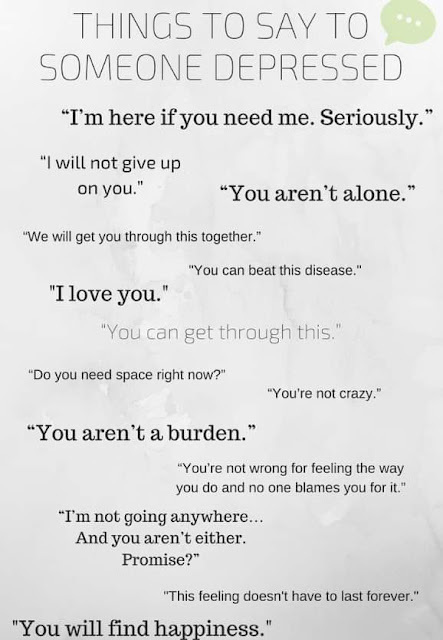 Responses like this mirror feelings and show that you've been listening, you really do care, & you're acknowledging & imagining what they've been through. Reframing - This can take more skill, but those who are depressed tend to look at life through a negative lens. Help restore the accuracy of their lens. If they make a statement like, "I'm a failure," rephrase it in a more realistic way. "No, you had a setback. But it's a lesson learned, & now you can try again." Or, "No, you struggled to get the results you wanted. But that doesn't define you." You can also compliment them by reinforcing their strengths, skills, & accomplishments. Maybe they say something like, "I'm ugly, no one will ever want me." And you can assure them how beautiful they are, or mention how you know others admire them. Encouragement/Instilling Hope - As previously explained, dealing with depression can make one hopeless. Their future may seem bleak to them, their view of the world may be shrouded in darkness. But you can help them see the light. We all need reassurance. Let them know things will be alright and turn out okay. Let them know that you are there for them & will support them every step of the way. Help them keep the faith alive, & remind them that there are resources out there for them if ever needed. Mental health services (i.e. therapy, psychiatry) & support groups are available (i.e. NAMI, DBSA, etc.) and you can refer them to these if they're interested. If you're willing, you can even offer to take them or accompany them so they're not alone & can see your support through your actions rather than your words.